You can also create your own metrics using custom SQL queries. The MySQL check is included in the Datadog Agent package. No additional installation is needed on your MySQL server. Edit the mysql.d/conf.yaml file, in the conf.d/ folder at the root of your Agent’s configuration directory to start collecting your MySQL metrics and logs. See the sample mysql.d/conf.yaml for all available configuration options. Note: @'localhost' is only for local connections - use the hostname/IP of your Agent for remote connections. For more information, see the MySQL documentation. echo -e "\033[0;31mCannot connect to MySQL\033[0m"
echo -e "\033[0;31mMissing REPLICATION CLIENT grant\033[0m"
Note: Wrap your password in single quotes in case a special character is present. To collect extra_performance_metrics, your MySQL server must have performance_schema enabled - otherwise set extra_performance_metrics to false. For more information on performance_schema, see the MySQL documentation. Note that the datadog user should be set up in the MySQL integration configuration as host: 127.0.0.1 instead of localhost. Alternatively, you may also use sock. See our sample mysql.yaml for all available configuration options, including those for custom metrics. Restart the Agent to start sending MySQL metrics to Datadog. Edit /etc/mysql/conf.d/mysqld_safe_syslog.cnf and remove or comment the lines. Make sure the Agent has read access on the /var/log/mysql directory and all of the files within. Double-check your logrotate configuration to make sure those files are taken into account and that the permissions are correctly set there as well. Run the Agent’s status subcommand and look for mysql under the Checks section. (gauge) The current number of nodes in the Galera cluster. (gauge) The number of free pages in the InnoDB Buffer Pool. (gauge) The total number of pages in the InnoDB Buffer Pool. (gauge) The number of used pages in the InnoDB Buffer Pool. (gauge) The utilization of the InnoDB Buffer Pool. (gauge) The number of current row locks. (gauge) The rate of data reads. (gauge) The rate of data writes. (gauge) The rate of mutex OS waits. (gauge) The rate of mutex spin rounds. (gauge) The rate of mutex spin waits. (gauge) The rate of fsync writes to the log file. (gauge) Fraction of time spent (ms/s) acquring row locks. (gauge) The number of times per second a row lock had to be waited for. (gauge) The rate of connections to the server. (gauge) The maximum number of connections that have been in use simultaneously since the server started. (gauge) The rate of delete statements. (gauge) The rate of delete-multi statements. (gauge) The rate of insert statements. (gauge) The rate of insert-select statements. (gauge) The rate of replace-select statements. (gauge) The rate of select statements. (gauge) The rate of update statements. (gauge) The rate of update-multi. (gauge) The rate of internal on-disk temporary tables created by second by the server while executing statements. (gauge) The rate of temporary files created by second. (gauge) The rate of internal temporary tables created by second by the server while executing statements. (gauge) Percentage of CPU time spent in kernel space by MySQL. (gauge) The key cache utilization ratio. (gauge) The number of open files. (gauge) The number of of tables that are open. (gauge) The rate of query cache hits. (gauge) The rate of statements executed by the server. (gauge) The rate of slow queries. (gauge) The total number of times that a request for a table lock could not be granted immediately and a wait was needed. (gauge) The number of currently open connections. (gauge) The number of threads that are not sleeping. (gauge) Percentage of CPU time spent in user space by MySQL. (gauge) The lag in seconds between the master and the slave. (gauge) A boolean showing if this server is a replication slave that is connected to a replication master. (gauge) Number of slaves connected to a replication master. (gauge) The rate of queries. The MySQL check does not include any events. mysql.replication.slave_running: Returns CRITICAL for a slave that’s not running, otherwise OK.
mysql.can_connect: Returns CRITICAL if the Agent cannot connect to MySQL to collect metrics, otherwise OK.
Can I use a named instance in the SQL Server integration? Can I set up the dd-agent MySQL check on my Google CloudSQL? How can I collect more metrics from my SQL Server integration? How to collect metrics with a SQL Stored Procedure? 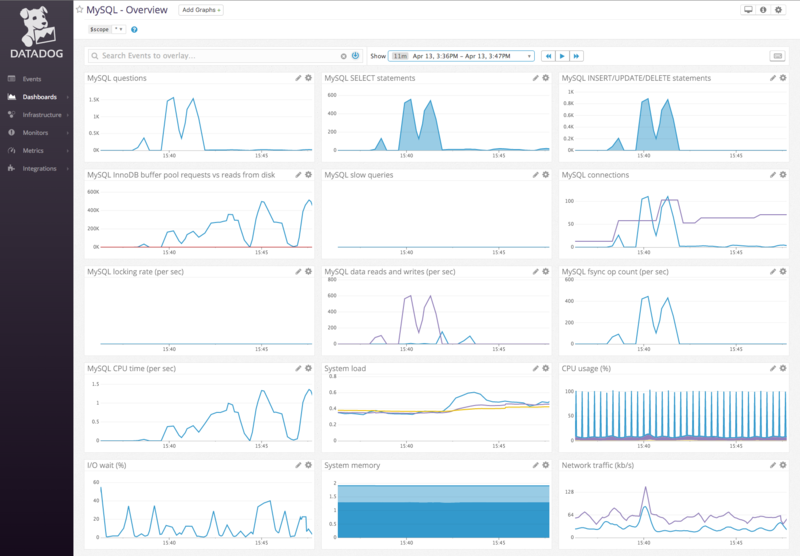 Read our series of blog posts about monitoring MySQL with Datadog.